some 'fake' goodies in Portharcourt. According to her,she bought fish pie but got home to find beans inside the pie. So she actually bought beans pie. 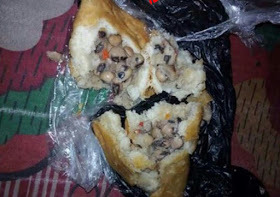 0 Response to "Nigerian Lady Buys Fish Pie Only To Get Home And See Beans Inside The Fish Pie"